Before Brad Pitt and Jennifer Aniston broke up on Anguilla's beaches, Anguilla was many celebrities' secret getaway. There is a group of celebrities that have been visiting Anguilla since the late 90s, with the simple desire to escape. Since the Brad & Jenn story hit the tabloids, the island has exploded. From Michael Jordan to Paris Hilton, Anguilla is attracting more celebrities than ever before. But who were the original celebrities? The ones who visited Anguilla before it was chic? At the top of the list is The Beatle himself, Paul McCartney. Aboard a private jet, Paul McCartney is a regular on the island. He stays at Exclusivity Villa, and keeps a low profile. Paul McCartney is one celebrity you never hear much about. "He's very nice, and down to earth." In Winter of 2010 he was seen dining with Liam Neeson at Trattoria Tramonto for dinner. That visit to the island made headline news in England. I would say "Until next time, Paul," but who knows? 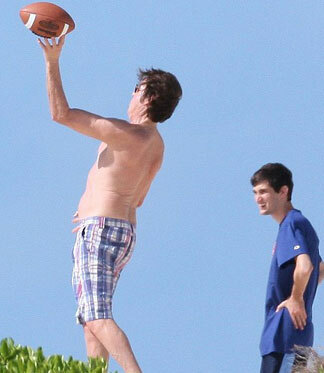 He keeps such a low profile, it's hard to know when Paul McCartney is in Anguilla!